Scott's Speedster 20 is fast and nimble. 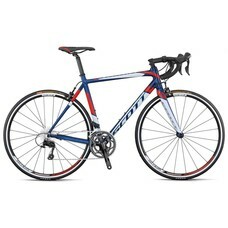 At its heart is Scott's light, stiff double-butted aluminum frame for race-caliber acceleration. The vibration-damping carbon fork smooths the ride, so you can ascend, corner, and cruise all day. You'll enjoy easy shifting and effortless climbing thanks to the crisp Shimano 105 drivetrain with wide-range cranks. Plus, sweet Syncros wheels with grippy Kenda tires enhance the ride. Syncros rounds it out with reliant components for a comfortable, confident riding position.